The D.F. 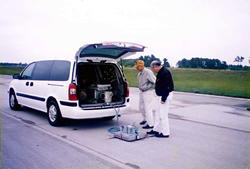 Tester is a portable instrument to measure the frictional characteristics of paved surfaces in laboratories and on field at roads, highways, airport taxi-ways, runways and other areas.Among many such instruments introduced to the market today,the D.F. 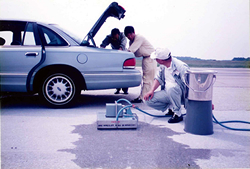 Tester is being used widely not only in Japan but also in the EU, the United States and many other countries at government agencies, construction companies, independent consulting companies,automotive manufacturers, tire manufacturers, research institutions and universities among many other organizations. The equipment has many exceptional features and characteristics that clearly gives unique advantages to the device. The easy handling and portability of the device make it ideal in using both on field and in the laboratory. Measures the friction from high speeds to static friction and depicts the friction ? speed relationship in one single measurement.The unit is easy to use and removes measurement dependency on operators and from the results, it also can be used in small restricted areas where other measurements are not possible. 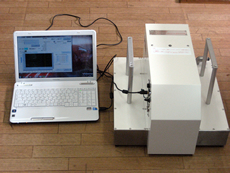 The DFTester also compliments the CTMeter laser texture measuring device in a unique way: it measures the frictional characteristics of the excat same physical surface where the surface macro texture was measured by the CTMeter giving direct match to analyze friction and texture. The D.F. 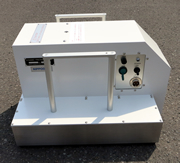 Tester is published in the [Pavement Investigation/Test Method Manual] editted by Japan Road Association] as an instrument to measure skid resistance on paved road surfaces. It is acknowledged and published in the FHWA's (Federal Highway Administration) Measuring Instrument Guide. The device also is incorporated in the American Association of State Highway and Transportation Officials'(AASHTO) "Guide to Pavement Friction" and in the same book that is also published by the National Cooperative Research Program (NCHRP) of the US Academy under Document 108. The New USB Version D.F. Tester has been designed to decrease the time required for and the cost of a measurement as it can complete measurements with the automated control of a connected Personal Computer in short time. (from starup through pin-up to speed, automatic water control from tank, measurement start and collection, analysis and storage of measured data. A set of three rubber sliders, with rubber composition identical to that of the ASTM (American Society for Testing andMaterials) standard test tire for skid resistance measurement, are used for measurements. Three rubber sliders are mounted on the lower surface of a disk that rotates with its plane parallel to the test surface. 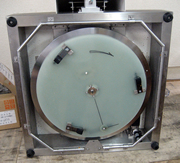 Once the operator set and software controlled circumferencial speed is reached by the spinning disc, the control system initiates water delivery and lowers the spining disc to the test test surface. The rubber sliders thus will be pressed to the surface by the weight of the device and the torque generated by the friction between the rubber sliders and the test surface as spinning disc is slowed down is measured. The calculated force then is divided by the weight of the disk and motor assembly to calculate coefficient of friction. The disk rotational velocity reduces gradually due to the friction between the sliders and the test surface. The velocity is also measured to indicate the relationship between coefficient of friction and speed. Laboratory surface samples, material samples and small construction areas. Paved Road Surface, Paved Road Surface on Bridge, etc. Highways, Motorways, Runways, Taxi-ways and other aviation surfaces. Measures the relationship between friction/skid resistance coefficient and speed in one measurment. Very short measurment time and good reproducibility. Measurement results are indepndent from operator skill. Portable and easy to carry by SUV or Minivan type automobiles. Watering is automatic from the Water Tank attached. Easy and immediate graphical display and analysis of measured data. Measured data can be analyzed based on comparison of other data graphically. Measured data can be seen on top of other data saved separately. Rubber Slider : 3 pcs. Weight : Net Weight = Approx. 22 kgs. Gross Weight = Approx. 32 kgs. 1. Operation Software CD 1 pc. 2. Power Cable 1 pc. 3. USB Cable 1 pc. 5. Screw to mount Rubber Slier 3 pcs. 6. Spare Fuse 30A 1 pc. 7. Screw Driver No.1 1 pc. 8. Bag for accessories 1 pc. 9. Key for the carrying case 1 pc. 10. Water Tank 1 pc. 11. Water Hose 1 pc.